as the bed of the instrument. One end of this bed has fastened to it a heavy metal plate i7, which carries the three glass plates A, Z), and B, The plate A is held in a metal frame which is rigidly fastened to the plate H. The frame which holds B can be turned slightly about a vertical axis to allow of adjusting B so that it is parallel to A. 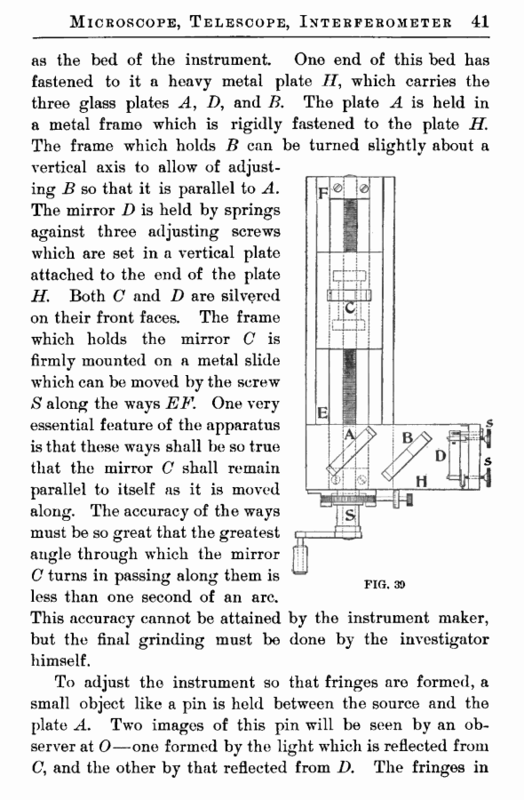 The mirror D is held by springs against three adjusting screws which are set in a vertical plate attached to the end of the plate H. Both C and D are silvered on their front faces. The frame which holds the mirror C is firmly mounted on a metal slide which can be moved by the screw S along the ways EF. One very essential feature of the apparatus is that these ways shall be so true that the mirror C shall remain parallel to itself as it is moved along. The accuracy of the ways must be so great that the greatest angle through which the mirror C turns in passing along them is less than one second of an arc. This accuracy cannot be attained by the instrument maker, but the final grinding must be done by the investigator himself. width and the position of the fringes in the field of view can be varied by slightly moving the adjusting screws. 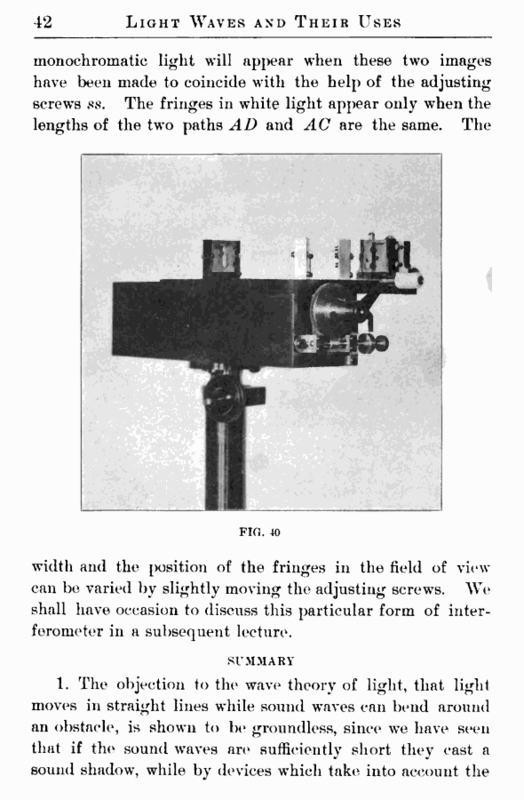 We shall have occasion to discuss this particular form of interferometer in a subsequent lecture.